Father’s day is June 17th. Do you need a gift idea? 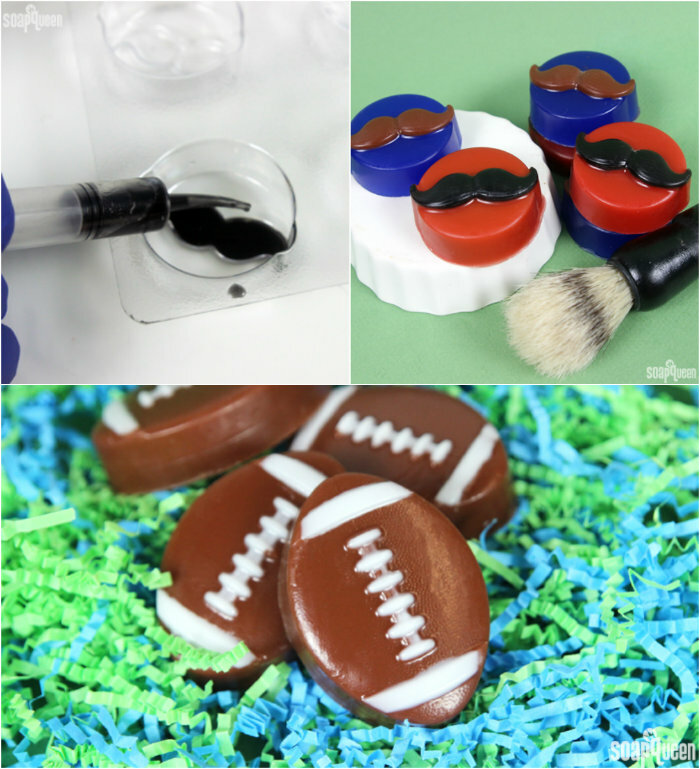 This shaving soap recipe couldn’t be easier using our foaming bath whip with a couple additional ingredients. 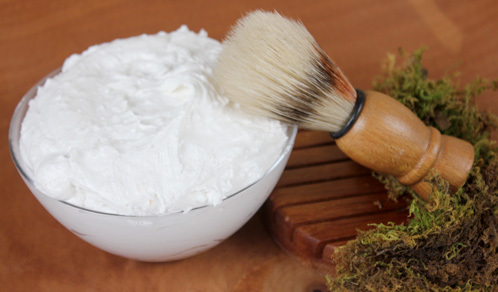 The foaming bath whip is a very gentle and versatile base (check out our favorite fluffy frosting recipe and sugar scrub). The bath whip has a great lather and a super creamy and and bubbly texture in the shower (ladies – you’ll love this for leg shaving). 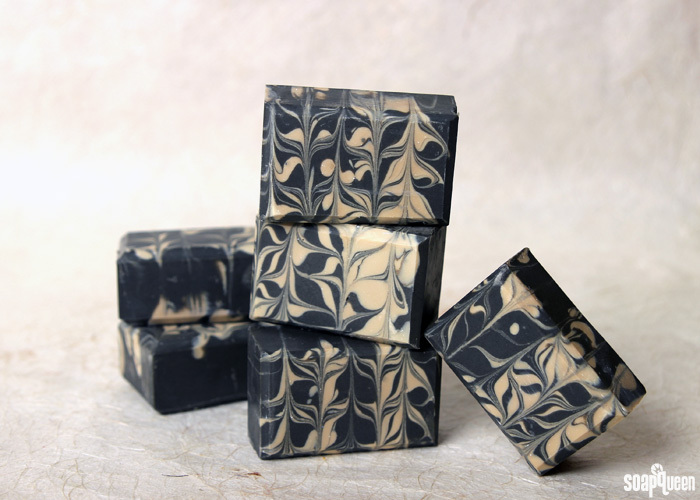 This easy recipe whips up a luxurious and soothing shaving soap with chamomile extract to help soothe Dad’s face. 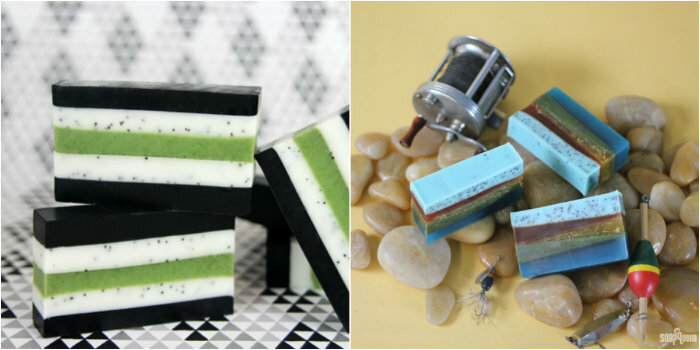 It’s scented with Blue Man Fragrance Oil which is perfectly sweet and masculine (base notes of Black Patchouli blended with Orange Peel, Sparkling Mandarin, Coriander Leaves, Star Anise and Venezuela Tonka). 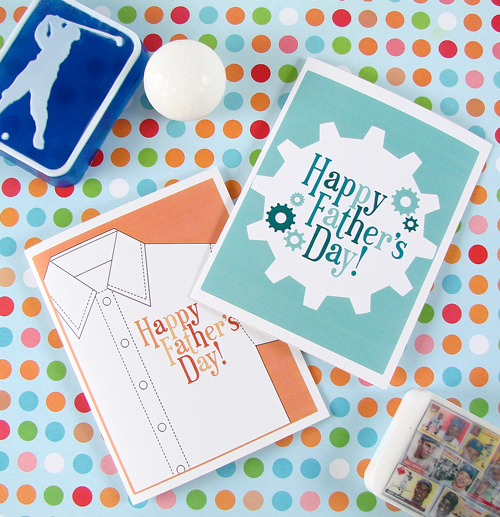 Father’s Day is next month (Sunday, June 20th). 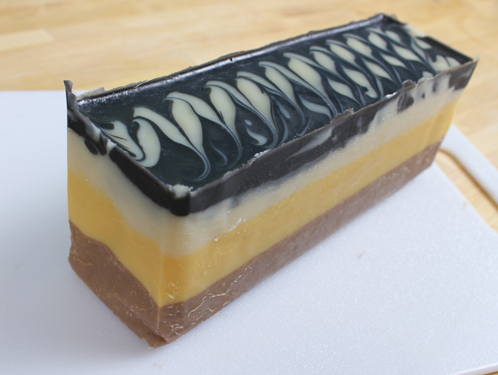 Now is the time to make your cold process soap so it has time to cure for Dad’s big day! Never made cold process before? No problem! 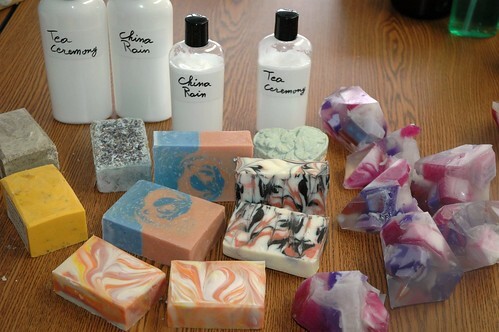 Check out our beginning series to cold process on Soap Queen TV. Be sure to check out all of the (free) videos before diving in. 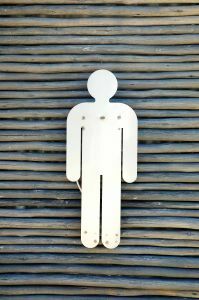 Don’t miss out on the safety precautions and basic instructions. Safety First: Make sure that you have on your goggles, gloves and long sleeves. Read a lye safety blog post HERE or watch a short video on lye safety HERE. 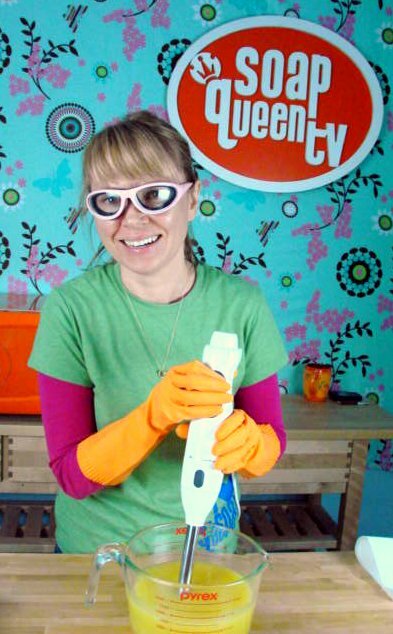 ONE: Put on your gloves and goggles and make your lye water. Measure out 10 ounces of distilled water and mix in 4.3 ounces of lye. Remember to always add the lye to the water and never the other way around. Stir the lye water until the mixture turns clear and set aside. TWO: Measure out all of your oils. 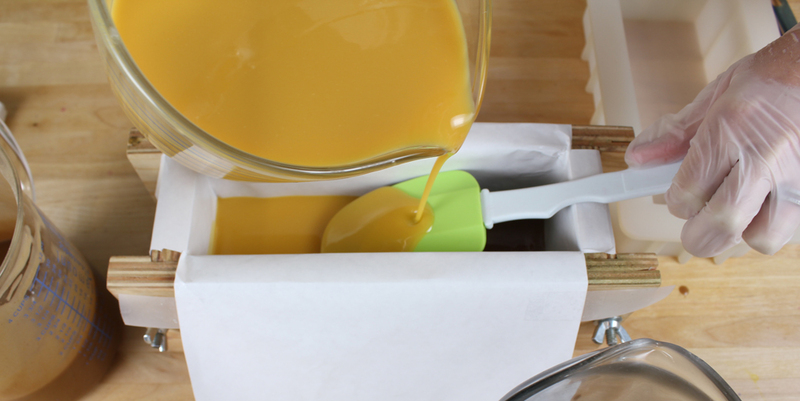 In a large heat safe container, heat and combine the olive oil, coconut oil, palm oil and jojoba oil. Give it a good mix. 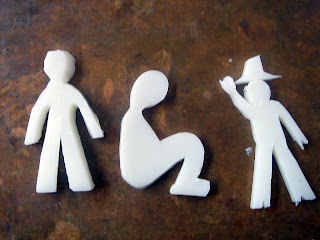 THREE: Stir your shea butter into the oil mixture until is completely melts in. 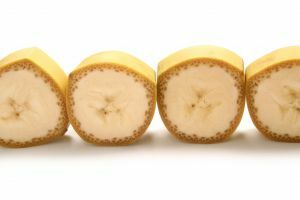 If shea butter gets too hot it tends to get grainy. 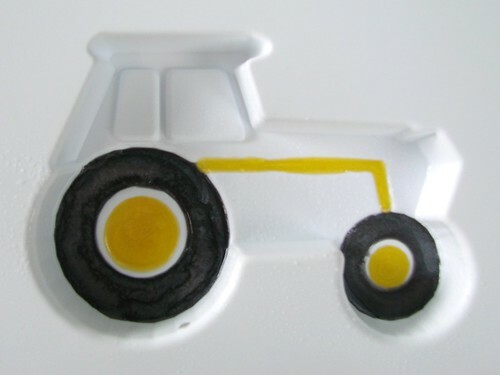 I like to stir it in and have the heat from the other oils melt the butter. FOUR: Let your oils and lye cool down. For this recipe, my oils and lye were both between 90°F and 100°F when I combined them (oils were 94°F and lye water was 98°F). 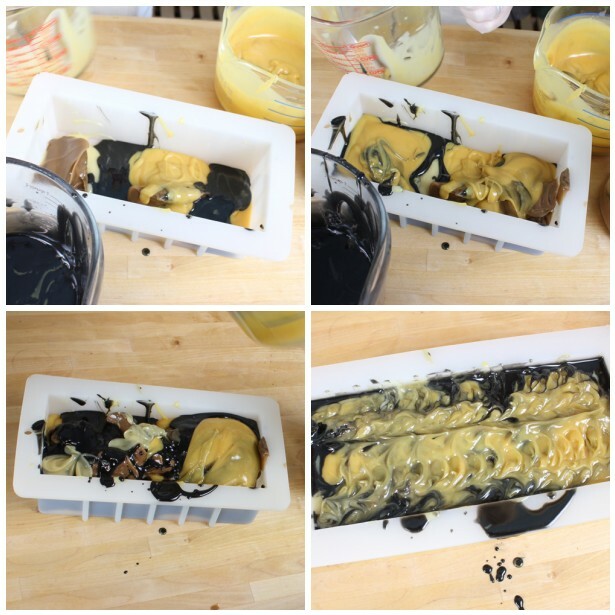 While your oils are cooling, we have a couple of things to keep us busy, like lining your mold, measuring out your fragrance, and making a blue slurry for the swirl. 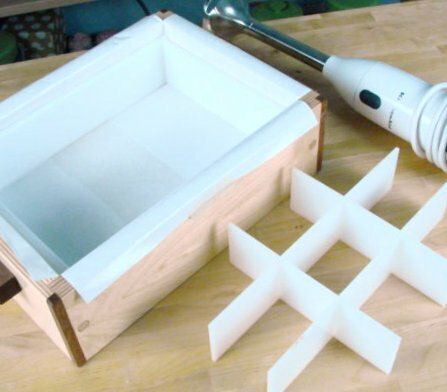 Line Your Mold: Use freezer paper to line your mold, shiny side up. 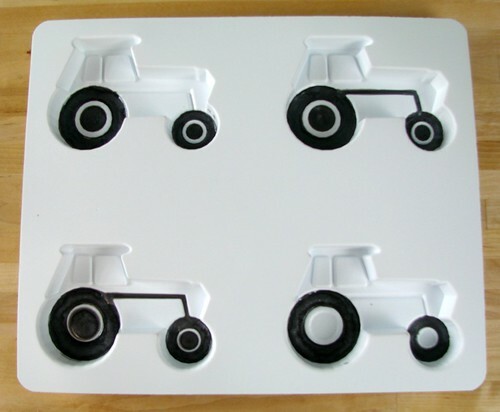 Once your mold is lined add the side and end border pieces and put your inserts together so they’re ready for action. Fragrance: In a small mug or bowl, measure out 2.8 ounces of Blue Man Fragrance Oil. I normally recommend .7 oz. 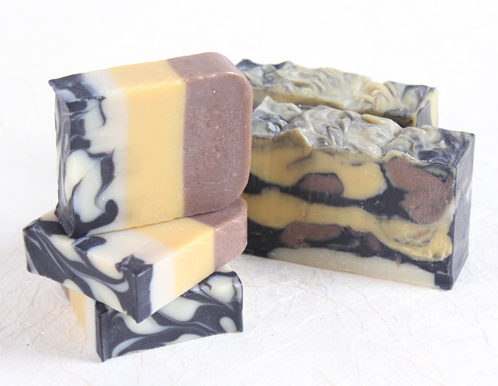 to 1 ounce of fragrance per pound of cold process soap. 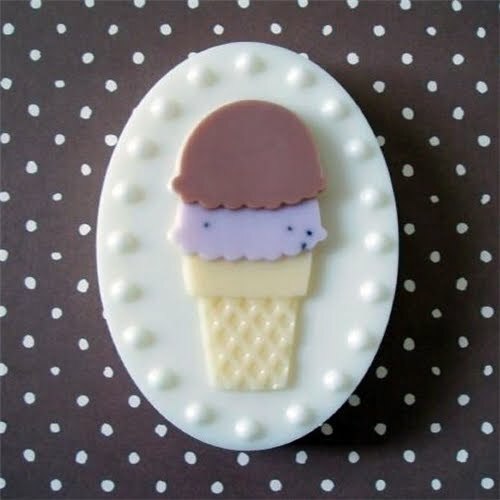 I’m using a little more this time so it’s strongly scented (because I adore, love, love, love, strongly scented soap). Blue Slurry: I learned this technique from Christy Rose of KBShimmer and love it. 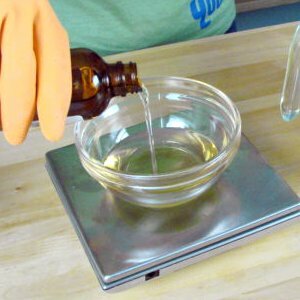 In a tall plastic container, combine ½ ounce of Jojoba Oil and ¼ tsp. 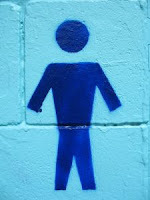 of Ultramarine Blue Oxide. 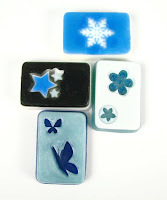 Mix together with a mini mixer or frother to break up all of the clumps. 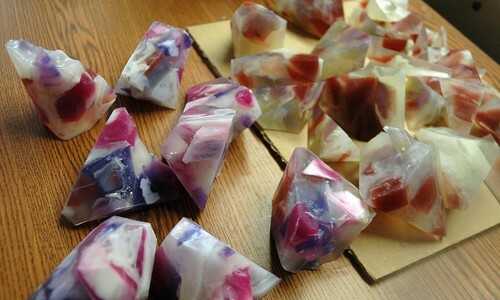 We’ll be adding some soap to this colorant later to swirl. 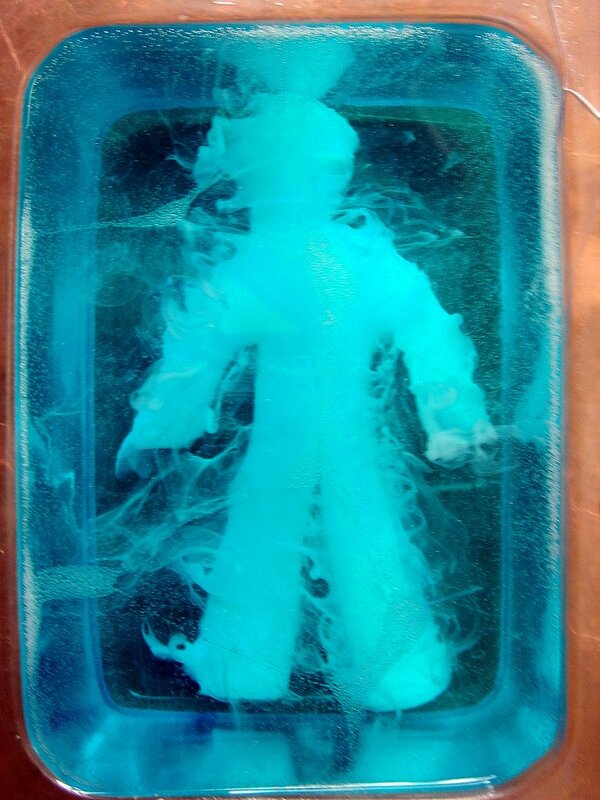 Fragrance: Measure out 2.5 ounces of Blue Man Fragrance Oil. 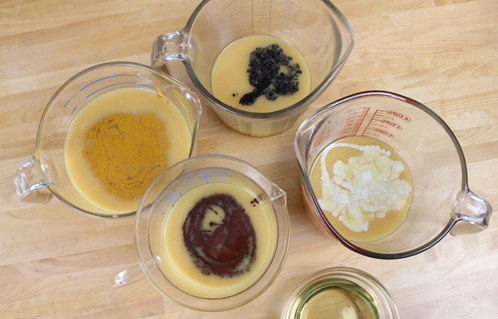 FIVE: Once your oils mixture and lye mixture has reached your desired temperature, it’s time to combine them. 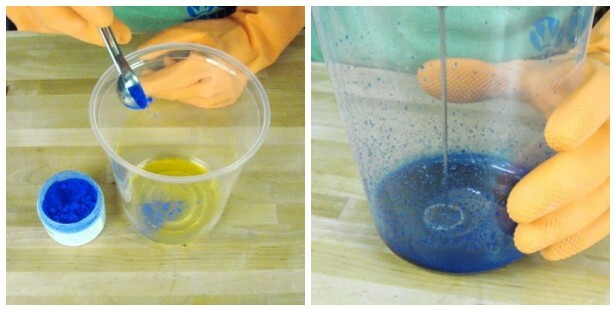 Slowly and carefully add your lye water to the oil mixture. Remember to “burp” your stick blender before turning it on. What’s Burping? 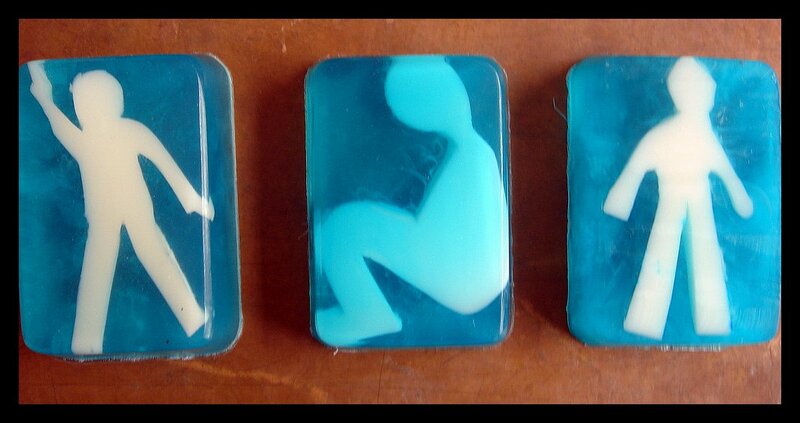 Burping gets rid of air bubbles. Give the stick blender a couple of taps on the bottom of the glass container while the head of the mixer is submerged in the liquid. The goal is to get the bubbles out of the head of the mixer before we start mixing. 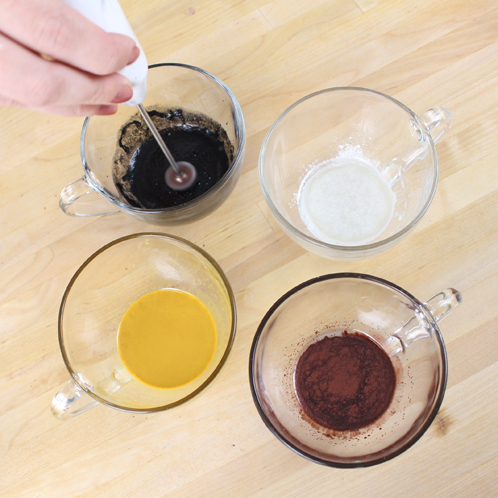 SIX: Mix with your stick blender until you have a thin trace (like a thin pudding mixture). 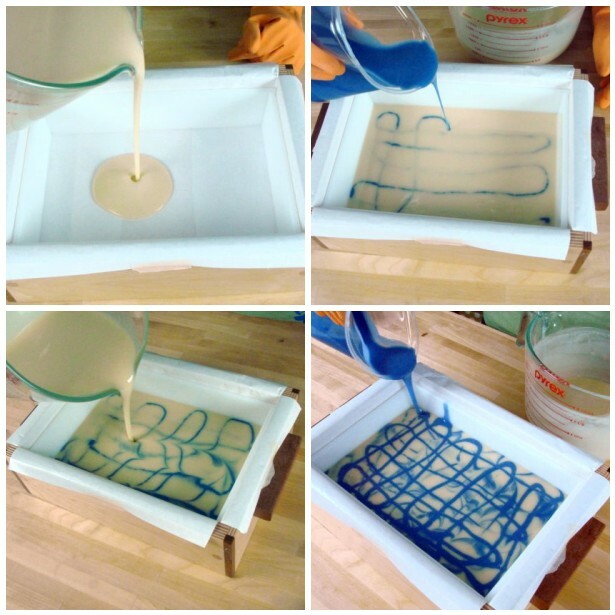 Then add 12 ounces of the soap batter to the blue slurry container and mix with your sick blender. Do not add any fragrance to this colored soap. Blue Man is a discoloring fragrance and we don’t want this part of the soap to discolor. 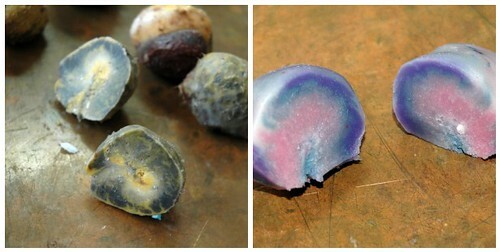 Then hand stir in ½ tsp of Blue Jojoba Beads. SEVEN: Add the Blue Man fragrance to the rest of the non-colored soap batter and hand mix with a spoon. 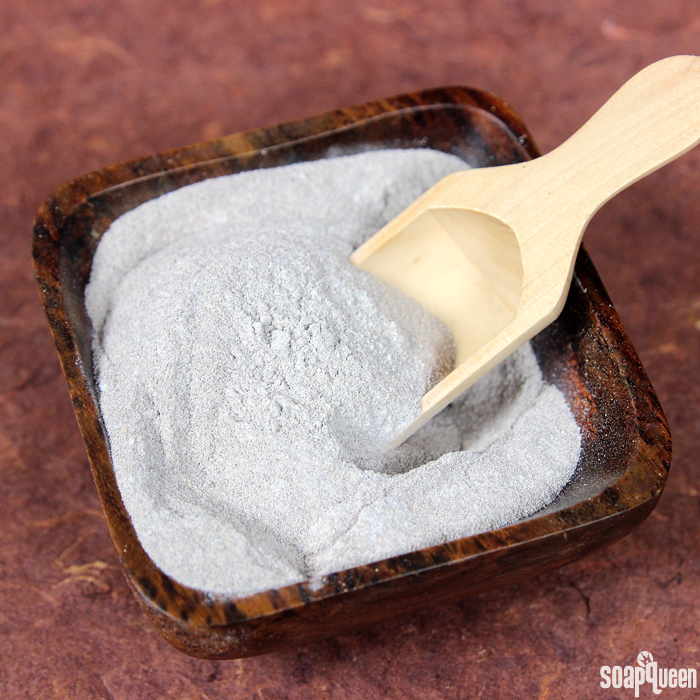 Then add 2 mini scoops of Titanium Dioxide and 1/8 tsp of Super Pearly White Mica. Mix well with your stick blender. Don’t forget to “burp”! 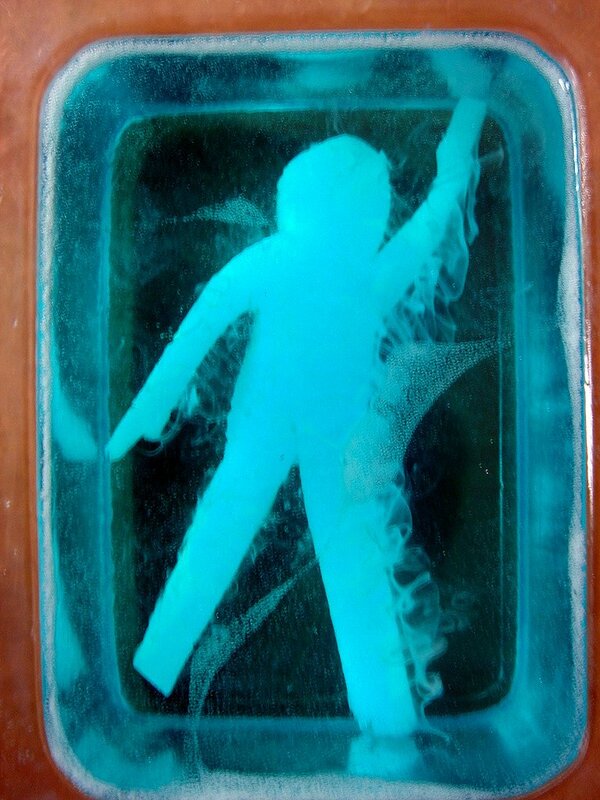 EIGHT: Both soap batters should be at a light trace at this point. 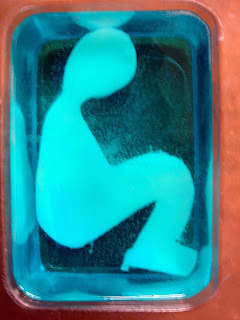 Pour half of the non-colored base into the mold. Then drizzle half of your colored soap in an “S” like pattern horizontally then again, vertically. 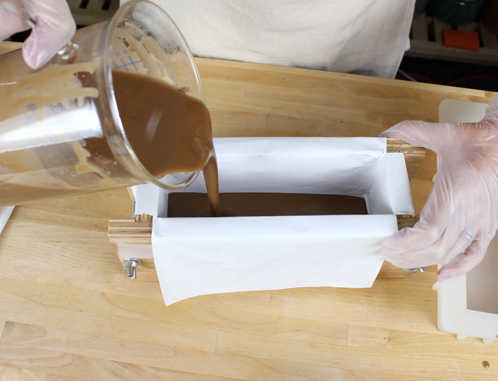 Repeat with the rest of your soap batter. NINE: In bigger molds I usually use a spatula or a spoon to swirl. Because this mold is so small, I recommend something smaller like a skewer. I actually used a dropper and the swirls turned out great. 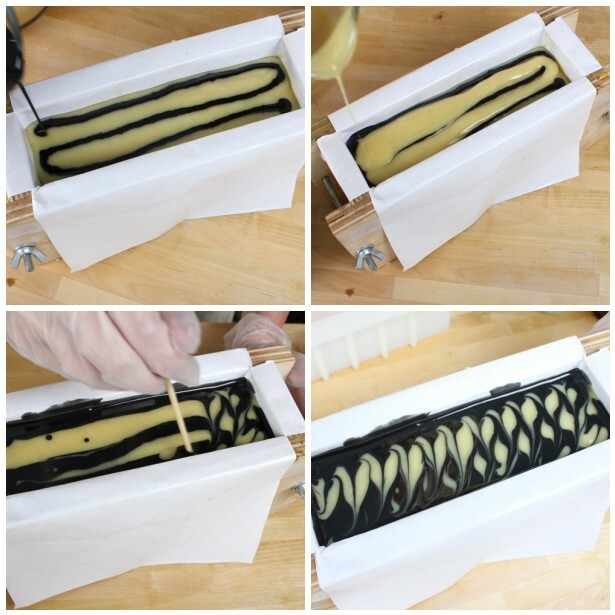 Swirl your soap in an “S-like” shape horizontally then again vertically. 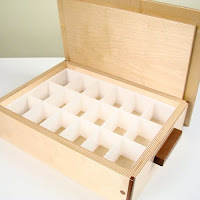 TEN: Drop in the assembled dividers and pop the lid on. Let it rest for 24-48 hours before unmolding. Then let it cure for 4-6 weeks. Click HERE for unmolding tips. 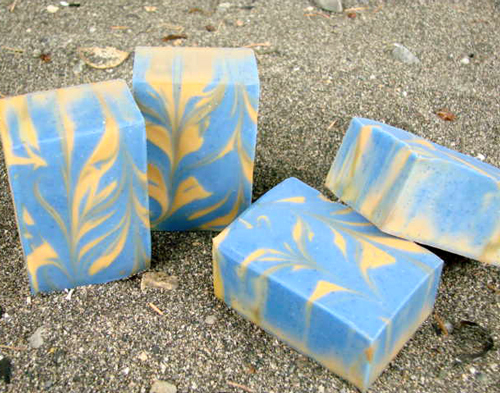 Bramble Berry just received two brand new fragrance oils that you’re going to LOVE: Papaya Coconut and Blue Man! I was squealing with excitement when I found out they were finally here. 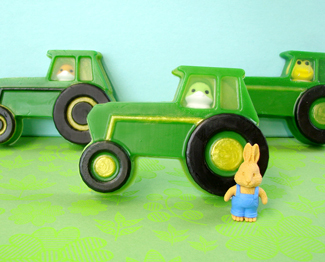 You’ll also want to check out the new Soapmaking Goggles, Surplus Blue Labcolor, Tractor Mold and Ice Cream Mold! 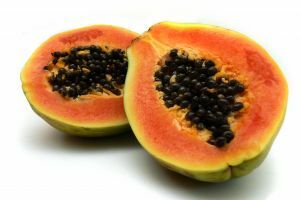 Papaya Coconut Fragrance Oil: Take a tropical vacation with a Papaya Smoothie and Caribbean Coconut. 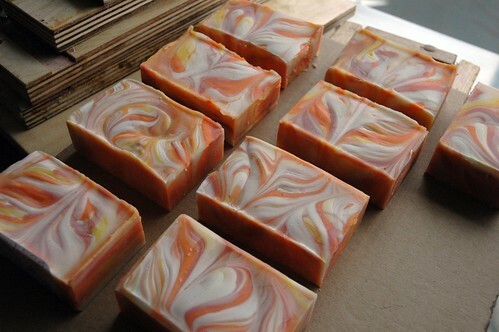 Get lost in the fruity notes of White Nectarine, Mango Juice, Mandarin Balm and Yellow Starfruit. Vanilla Bean adds a sweet note that you can’t resist. Discolors to a light brown and does great in cold process. 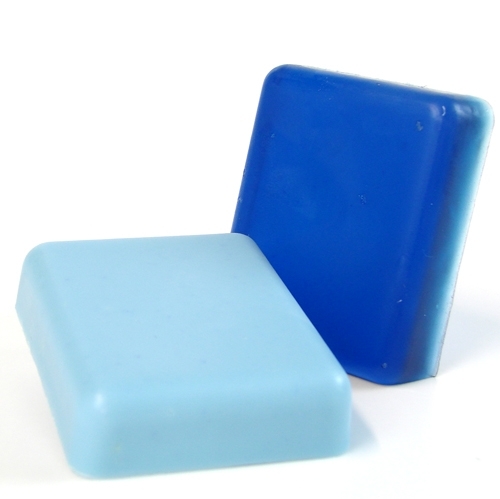 Blue Man Fragrance Oil: This is a duplication of the popular men’s cologne, Aquolina Blue Sugar. The base note of Black Patchouli blends perfectly with Orange Peel, Sparkling Mandarin, Coriander Leaves, Star Anise and Venezuela Tonka. It’s surprisingly sweet and majorly masculine. Discolors to a light brown and does great in cold process. Pink Safety Goggles: These fashion forward safety goggles are a cold process soapmaking necessity. 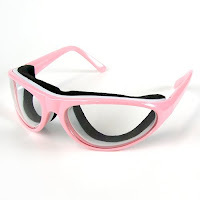 They seal completely around the eye for optimum protection and come in a handy carrying case. Surplus Blue LabColor: Here for a limited time only! This unique mixture of some of our recent experiments with LabColor blends will give a charming, if slightly unexciting, medium blue color. 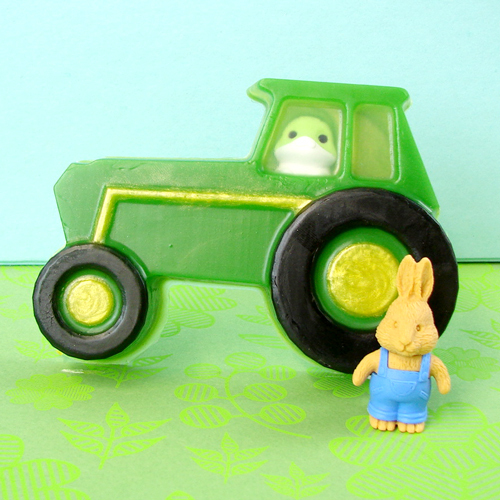 See the Tractor Soap tutorial here. See the Soapylove tutorial here. Yes, this is a real product and it totally made me laugh out loud today (thanks for sending it, Dad). It’s particularly ironic given tomorrow’s celebration of women everywhere. Watch the funny YouTube commercial here (I hope it makes you chuckle too). 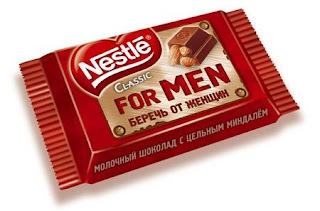 So, if you’re a manly man and won’t admit to craving a bonbon or a truffle every once in a while, then this is the chocolate for you! 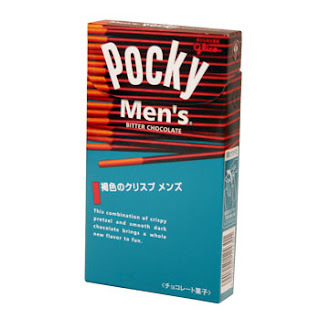 Here’s another one I just found: Pockey for Men at the Asian Food Grocer. Apparently it’s not as sweet as the original pocky. 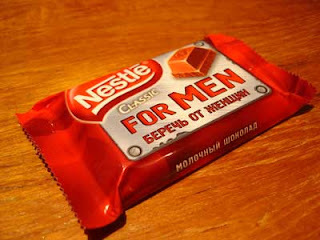 We women can handle our chocolate sweet!